The Central Pacific coast of Costa Rica is a beautiful area sandwiched between towering cloud covered mountains and palm studded beaches. The area is generally lush and green with plenty of wildlife in the forests. 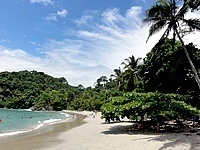 Manuel Antonio is the most popular destination and for good reason. It is here that jungle lined hills collide with beautiful white sand beaches creating an environment that is just as popular with animals such as monkeys and sloths as it is with us humans. Often times, one can literally sit on the beach and observe wildlife at the same time. Further up the coast, Playa Jaco is a great surfing town which in recent years has grown to a small city. There are more condos here than anywhere else in Costa Rica. If you're looking for big wave surf, drive 5 minutes south to Playa Hermosa where they have the annual Billabong Surf Championships. 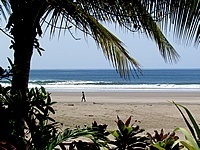 Click on the links to read more about the Central Pacific coast of Costa Rica. Manuel Antonio is the most popular beach in Costa Rica and for good reason! This area really is paradise with gorgeous palm studded beaches which are surrounded by a jungle lined hillside. With loads of wildlife and many adventures available, this is an excellent destination those seeking a tropical beach destination with activities and wildlife. Jaco Beach is a surf side mini-city complete with American style restaurants, high rise condos, casinos and nightlife. The white sand beach has large waves which are great for surfing. Jaco is considered by many to be an adults playground and not exactly family friendly. 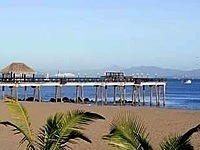 Hermosa Beach is located just south of Jaco. 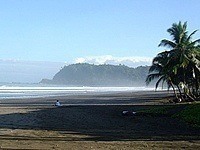 This is one of the better surfing destinations in Costa Rica with BIG waves. The waves are big enough to attract international surf competitions, which are held here annually! This small surf side village has a few roads which are lined with hotels and restaurants. An aging port city, Puntarenas is located along the Central Pacific coast of Costa Rica. This is a favorite beach area for local Ticos, but not visited often visited by tourists other than just passing through to the ferry or other beaches. Most visitors prefer Caldera Beach, which is located a little south of town. Visitors should know in advance that locals can be territorial in this area.